Deal Book. It was flat for a long time. Then it went up and then it went down and we don’t know why, when or even if it will ever rise again (Reuters, January 23, 2013, Netflix in surprise holiday-driven profit, shares jump 35 percent). Investors are of all sorts and in order to be effective, express themselves with their colourful language and their pocket books. 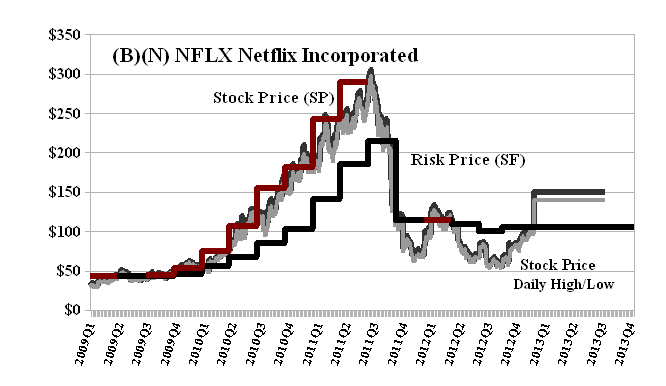 We only bought or held the stock of Netflix (please see Exhibit 1 below) when the ambient stock price which we summarize as the Stock Price (SP) (Red Line, a step-function) plausibly exceeds the Risk Price (SF) (Black Line, also a step-function) and otherwise not. Using that simple rule, we bought Netflix at $40 in 2009 and held it through $290 two years later in 2011 when we sold it and haven’t bought it or held it since simply because of the One Rule – we only buy or hold the stock of a company if the stock price plausibly appears to exceed the Risk Price (SF) which is a calculation and estimate of the “price of risk” (please see our Post, The Price of Risk, August 2012) and otherwise not. Buying and selling stocks is also a discipline. We don’t usually care very much about at what price we buy the stock once the rule is in effect, but the selling discipline needs to protect the price at all times (please see our Post, The Wall Street Put, August 2012, or almost any of our (B)(N)-posts) and it can be done by a simple stop/loss when we are in a profit position or “collars” when we are uncertain and might want to hold the stock while we think about it. In contrast to that rule, many investors nod sagaciously and say “Hockey Stick” and hopefully, “He shoots. He Scores” but without a compass, they don’t know in which end, so to speak, or even if they’re holding the stick correctly. Some investors will be buying the stock and are long and others will be selling or shorting the stock (or “stick” as it were). It is reported that a well-known “activist investor” holds an almost 10 percent stake in the company and has said that they felt that the company was an attractive takeover target even as the value of their shares have soared from $445 million to $769 million since they started buying them in September of just last year (between roughly $70 and the current $100 or so) and, no doubt, the mere word “takeover” has popped the price today by another $40 or more. But, where’s the goal and how should we hold the stick now? The current Risk Price (SF) is $105 and the current stock prices already exceed that by a substantial margin ($142 today). The company has never paid a dividend and now has a lot of well-heeled competition in the fickle and competitive market for “entertainment” that they invented, but, of course, we don’t know the future. If we wanted to play today – and possibly break our rule about knowing the “ambient” stock prices – the February put at $140 costs $6.60 per share and the February call at $145 sells for $6.35 so that for $0.25 per share ($6.35 less $6.60) we could spend some time in the penalty box and possibly help the team and still get paid for it no matter who scores. Netflix Incorporated is a provider of internet subscription service streaming TV shows and movies. Its subscribers can instantly watch unlimited TV shows and movies streamed over the Internet to their TVs, computers and mobile devices and in the United States.